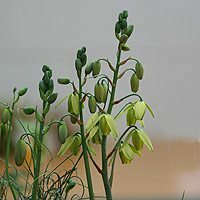 The species Albuca are a relatively large group of bulbs from Southern Africa and like most plants from this region do very well in South Eastern Australia. In general they are easy to care for in sunny to part shaded position, they do require a well drained soil. Flowering early in summer these are a hardy bulb, fairly drought tolerant and they can be grown in pots or containers. A. canadensis, usually evergreen and requires some moisture up until the end of its flowering season. Height 50cm. Spread clumping. Position full sun to part shade. Flowers early summer. Medium drought tolerance. A. circinata syn A. namaquensis is from South Africa and is similar to A. spirals in growth habit, nice yellow open flowers with faint green markings, but difficult to find for sale in Australia, leaves tend to coil in hot weather. Other species include : A. batteniana, and A. nelsonii.